September is the golf peak season generally, and Belgrade has a great event to complement this trend. For second year in a row, we will have a chance to enjoy this unique and classy golf tournament. Apart from the competition on the golf course, some engaging program is prepared for the ones that are just being introduced to golf. On behalf of selected supreme lifestyle brands from various industries, SEE Golf Management have customized and aligned attractive hospitality programs for their guests and business partners. 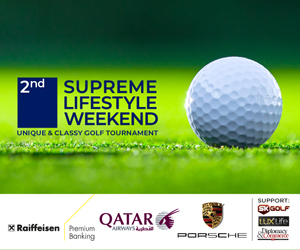 It is well known truth that golf events offer opportunities for business networking around the world, and this is exactly the idea behind SUPREME LIFESTYLE WEEKEND event. Last year participants and sponsors guests have praised the chance to enjoy the golf tournament and the overall atmosphere during that weekend in Golf club Belgrade. This year the event will host new guests from diplomatic and business world and we are sure they will all enjoy this original and discrete lifestyle event.ogađaju.